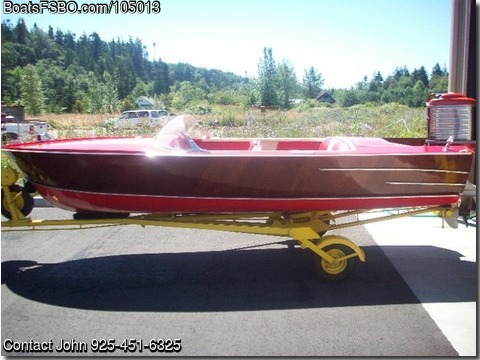 Boat is located in Concord,CA.Please contact the owner @ 925-451-6325..Restored Completely as new by original owner and employee of the factory in Denton,Texas. A five crisscross layer, molded plywood hull with two passenger compartment deck of mahogany painted red with White (yellow jacket stripes, usually yellow, Trademark). A company boat, believed used by Roy Rodgers, company owner for Photos and TV Advertising. The boat appeared in several magazine and photo adds with Roy, his wife Dale Evans and three children. In a Fury model such as this, with two Mercury engines Roy Rogers and co-pilot won several outboard races. Holding the record until today for faster from New Orleans to St Louis via the Mississippi River AND Long Beach to Catalina Island. On these events two Mercury Marc 78’s were used totaling about 140hp. The hull has a round chine, below the spray rail allowing for full power turns in its own length. The bottom below the spray rail was fiberglassed by the factory in 1958 at the request of the owner. The interior is completely upholstery, seats, sides and dash board. The padded Dashboard has a tachometer, Speedometer, and the famed Mercury Quicksilver single cable steering in matching red. Engine is a Red Mercury Marc 78e with steering and controls having, key ignition & starter & choke also mounted on the dashboard. Running lights and anchor light. Has complete records and original documents. A large set of photos is available upon request.